Thomas Cahill will forever be on my cool-authors list for his book How the Irish Saved Civilization. 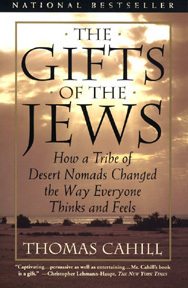 Finding myself with a copy of The Gifts of the Jews to hand, I decided to give it a read depending upon Cahill's previous excellent work. I found certain parts of it quite nice - his interpretation of the story of Ruth within a historical context and the explaination of the 10 commandments as 10 words as examples. However, his primary hypothesis - that the philosophy of the Jews is indespensible to modern thought - is never proven. At one point, Cahill indicates it would be "impossible to understand" people like Gandhi and many others "without recourse to the Bible." His overstatements and oversimplifications of this nature are grating; I am sure that Hindi philosophers have no trouble understanding Gandhi without having to read the Bible. The beauty of the biblical texts and the unique humanity expressed therein are wonderous as literature, even to an atheist. But to put forth that system of thought as the wellspout for any other system of thought insults millenia of scholarship in other systems of belief. I read this as an interesting piece covering a few biblical and anthropological stories and enjoyed it; had I tried to make of it a philosophical insight into the human condition I would have found it wanting. Disappointing. I loved How the Irish Saved Civilization,too, and would have liked to want to read this one.